As you probably know from reading some of the recent posts in this space, I’ve been enjoying using GlassAlmanac.com as a guinea pig for some SEO and visibility experiments/efforts. A recent experiment has focused on Twitter search result visibility. I don’t have any incredibly deep insights to share, so move along if that’s what you’re here for. But I did want to pass along the perhaps obvious idea that Twitter’s “people” search results are heavily weighted toward the account name … but there are other factors at play, too. That’s obviously a keyword I’d like the account to be found for when someone does a Twitter search. What I did: Again, nothing groundbreaking here. I just changed the display name to “Google Glass Almanac,” as you can see in the image above. Then I sat back and waited. Result: It took about 10 days or so, but @GlassAlmanac started showing up in the first 10-15 accounts for a “google glass” search. Then it reached the top 10 accounts. And it seems to have settled in at No. 6 when I’m logged in and No. 8 if not logged in. In any case, the point is that putting the keyword in the account’s display name boosted it way up in Twitter’s search results. I don’t believe that can be attributed to other data because @GlassAlmanac still only has 130 followers and doesn’t get much interaction at all on Twitter. What’s really interesting to me is that, whether logged in or not, @GlassAlmanac still can’t outrank “off-topic” accounts such as Google Developers, Google Students and Google Cloud Platform. None of those accounts are about Google Glass. None of them mention Glass in their display name or description. And yet those three accounts have been unbeatable so far. Is Twitter emphasizing the “google” aspect of my query and ignoring the “glass” part when it includes those accounts in its search results? If so, why those three? Why not @GoogleChrome or @GoogleMaps, both of which have significantly more Twitter followers? That much is a mystery to me. Based on my little experiment here, I’d say it does help to have a keyword in your Twitter display name, but there are other factors at work, too, that can override it. And now the waiting and watching shifts from Twitter search results to Google’s. That’s really interesting (and obvious enough to not be obvious). I wonder if the ranking position is related to the use of hastags in recent posts for that particular keyword (though it doesn’t appear that these accounts recently had #glass tags)? I currently have you ranked at number 8, right behind Matt Cutts and the @Gglasstweets account. Hi Victoria — I don’t think those three “off-topic” Google accounts would ever tweet about Google Glass. If they did, it would be extremely rare. 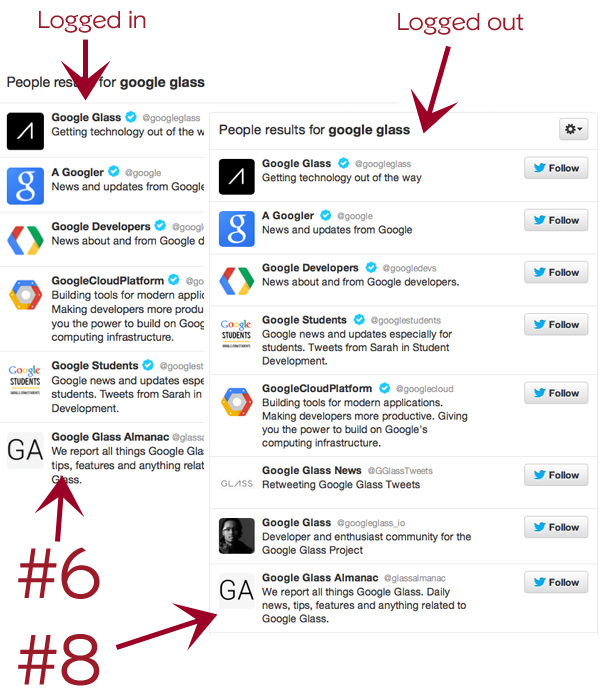 Google has a Twitter account specifically for Glass. « Is This a Google Hummingbird Search Result?